7:01 PM: Emergency responders are arriving in the 8100 block of 31st SW [map], where someone is reported to have been shot, according to scanner traffic. Police are reported to be looking for a suspect. More to come. 7:14 PM: According to radio transmissions, a black Jetta might have taken someone away from the scene, headed south from 31st. The victim, a man around 25-30 years old, with at least two gunshot wounds, was said to be undergoing CPR. 7:27 PM: SFD confirms that the victim has been declared dead at the scene. 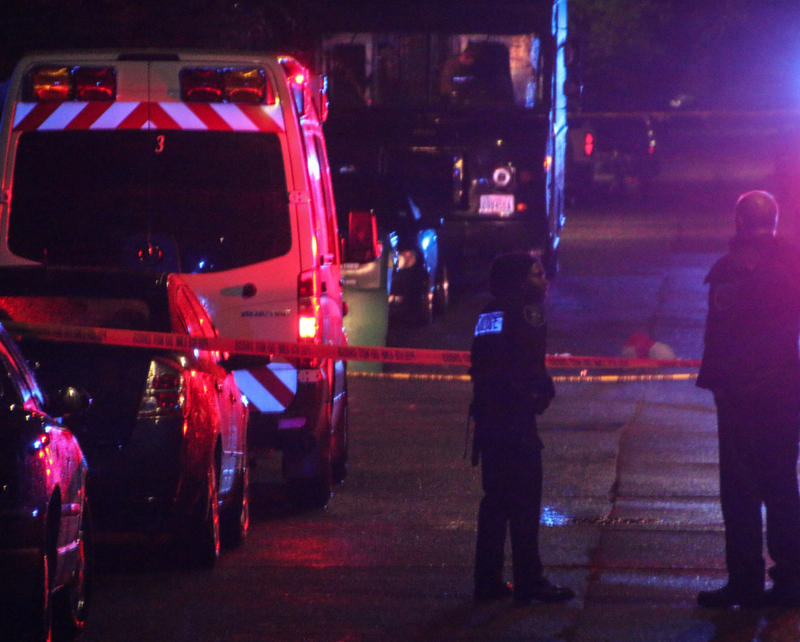 That would make this the fourth homicide investigation of the year in West Seattle, less than two weeks after the third. 7:55 PM: Homicide Unit detectives have arrived, our crew reports, as has citywide media. Police say they are looking for one suspect, but no description has been made public. 9:15 PM: We are back at the scene, where Det. Mark Jamieson has just briefed media. No arrest, no description – the killer is believed to have fled on foot and then gotten into the aforementioned car. The victim was found in the street, and evidence – shell casing(s), we learned earlier – indicates he was shot there, but there’s no info about whether he lived in the area. Police are expected to be on scene at least a few more hours. 31st is blocked at Thistle on the south. WEDNESDAY AFTERNOON: One suspect is in jail, another is being sought, police tell us. We’ve started a new story here. 65 Replies to "UPDATE: Man shot to death on 31st SW; police searching for killer"
Holy crap…why so much response? Usually a med 14 means two victims, but not always (any lurking SFD readers hopefully can clarify). Because it was a murder! If someone you knew and loved… whould you complain?? Moose-It wasn’t a complaint, it was a question pertaining to realtime911. There was some initial confusion as units were dispatched as to how many people had been shot. While responding, some SFD personnel heard reports of 2 victims and requested additional aid and medic units. As firefighters arrived, the number of patients was confirmed at 1, and units that were not needed were sent back in service from the scene. Thank you for clarifying. I /we really appreciate when professionals can add to the conversation. Crazy! Just drove past 31st viaThistle. Close to Sealth. These young kids. Still no news on Westcrest stabbing case … So tragic. i was sleeping but my husband heard the sound which he thought was a shot and went out the side of the house to take a look. He saw someone with a reflective vest on the ground and other people attending to him and calling 911. The neighbor said he thought that person was loaded into an ambulance. things like this don’t happen on my street. The level of response is completely unrelated, ever, to where it happens or what kind of neighborhood it is. There is a certain level of SFD sent when weapons – whether gun, knife, sharp piece of glass, etc., is involved – are reported to have caused the injury. And in this case, with a suspect or suspects at large, that’s going to draw a lot of police, for perimeter monitoring as well as the primary search. Wtf- The blog mentioned one person shot but the realtime 911 posted 14 rule which usually means multi casualty if you’re not familiar. So that’s why I asked. It has nothing to do with your ” established neighborhood “. alki Res. hope you’ve simmered down by now…yes, there was only one victim, and he died. Berating the editors of the blog is not going to change that. What a sad happening, whether the 911 post said a 7 or a 14…it doesn’t matter, in the end. What matters is that someone was, it seems, targeted, shot and killed on one of our streets, not whether any of us are right or wrong. JanS- really tired of your snide comments on threads. Seems you have nothing better to do than put people down. Where in this thread was I berating the editors? Seems we handled our conversation just fine like adults and they knew just what I was talking about. Officers were questioning one of the renters on the west side of 31st . As we have noted above, the victim has been declared dead at the scene – they were doing CPR but couldn’t save him. We have not confirmed a description with police. We have a crew at the scene and also are monitoring the scanner from elsewhere. UPDATe: UPS driver questioned at scene; allegedly witnessed murder. I don’t think it is a good idea to publicize and identify potential witnesses. We don’t know what kind of murder this was. You just put this guy in danger. No he did not. Can you identify him from whats written? ‘Yeah he wore brown shorts.’ There are quite a few UPS drivers and if this one actually happend to see it the biggest risk is that the shooter also saw him, not a post on WSB. Look: I live on this street and this happened to my neighbors and my family. Your stance on this is an outdated, paranoid, arm chair-detective mentality and the idea that I’ve put someone in danger is offensive to me and cowardly on your part. We use this blog as a means to disseminate information to concerned citizens this blog serves, not to inject vitriol that is useless. The only harm these UPS drivers face is falling down on someone’s sidewalk on 31st St. The only retribution here is love. Very well stated, Bo… first off I’m so sorry you and neighbors are dealing with this… we are a few blocks up and share your concern and love– and are here as support. AND THAnk you for addressing and describing what this forum is about! I’m getting awfully tired of folks interjecting their un-conscious comments to our community family… we send peace and love down to your area. Starting walking my dog around 715 when a neighbor told me to go back inside. I’d heard the sirens and screeching wheels but didn’t think too much of it, always hear sirens go by… we’re about a block away. Is the area still blocked off? I hope they catch the person/persons responsible. What a horrible end to a dreary day. Scared – it’s likely to be blocked off for some time. Our photographer says delivery drivers that just showed up in the area were turned away. This is in front of my house. Watched almost the whole thing go down and my driveway is blocked with crime scene tape. I’m so sad for the victim. This is awful. I’m so sorry Liz. I’m down by Cafe Ladro area if you need a place to recoup. It had to be horrible. I’m sorry. Liz, we believe that the victim was a cherished friend and we’re trying to get information. Would you be willing to reach out to me? Liz.. is this a neighbor? I think so. Bright yellow house on the middle of the block. I’m sickened by this and my heart goes out to the victims family. I saw two SPD arresting a white male on the east side of 35th around 6:45 somewhere between westy’s and Barton. I am assuming this is unrelated based on the time? The initial callout for this was at 6:53 pm so not likely related. Another young person killed, and for what. RIP to the victim, my most sincere condolences to the family. We’re at critical mass West Seattle, this is the 3rd young victim since the start of summer in our great community. Our children aren’t safe here anymore, the last victim was 15.
i know the house though i can’t say i know the people who live in it more than to wave at on the street. This is such an unlikely thing to happen here. Very scary. I was walking my dog a block from here on the street the getaway car went down right when this happened. Really hoping for some more details soon, this is very close to home and sad. Keep your eyes open, neighbors! Is the chief of police still working 3 jobs? Meanwhile the city leadership continues to focus on Airbnb rentals and coming up with new ways to raise taxes while the unsolved murders continue to rise. I’m aware of the Chief’s full time position in Ireland, here, and many have said she’s taken a 3rd part-time position somewhere. I believe she’s relocated to Ireland by the way. And I agree Joel, the city council/city leadership have perverted their priorities. I was glad to see Moon speak out against O’Toole’s Ireland position. Sadly Durkan “had no comment”. They’ll get him. Or, at least get a tag on that getaway car. This is creepy, close to school zone. I disagree. We still have 3 unsolved murders here going back years.. Gregette Guy, the 23 year old who was shot on Alki this summer and the 15 year old who was stabbed to death very recently. Yesterday’s may fall into this growing trend of unsolved murders. I too am a neighbor and am saddened at the loss of a young person. I’m also angry that it was so close to home. So Joel- do you think the police are not trying to solve these murders? Do we need a larger police force- yes. From what I’ve read- the city is hiring – or trying to hire more police officers- but from application to on the street takes time. The officers we have are doing the best they can. For some of these – unsolved- SOMEONE knows SOMETHING! Before the 200k chief of police takes on 2 side hustles I would expect murders to be solved. That’s not true Gene. The SPD isn’t “doing their best”. Far from it. They’ve largely depoliced in many parts of Seattle. I’m so sick of hearing “but some police officers are good!”, or “they’re doing their best!”. I see SPD drive by crimes in progress downtown and on Alki all the time. Explain that Gene. How are those men and women “doing their best”? And Gene, why haven’t the SPD met the reform requirements that were set years ago? Your excuses hold no air, nor do the SPD’s. 4 unsolved murders now Gene, 1 of them a 15 year old. And you’re still holding the SPD’s water. Incredible. The person shot was a coworker of mine. He was a really good kid that just moved to that area. We are all missing him and just can’t understand how or why this happened. RIP Eddie. I’m so sorry Ken. I’ve heard amazing things about him. Devastating. Jan….not sure where I bitched about the police force…..I don’t think the chief of police should be running side gigs….especially with unsolved murders. It is sad and it does concern me and I hope it’s not another unsolved murder in WS. Joel–you’re doing a lousy job of interjecting some brain mush that is ugly and unnecessary right now. There isn’t enough oxygen in west seattle for you go on about what you have thought about that others haven’t. Please, enough with the Alex Jones additive. Things like this make me want to be closer to my neighbors, not read sniping comments. I’m so sorry for this family and these neighbors; I’m mourning the loss of a young man and feeling terribly sad for his family and friends. I am hopeful for justice, it seems there is a good lead and we have no reason to believe the police won’t investigate thoroughly. Peace, neighbors. Wow! Far too close to home. So sorry for victim and family. How soon until we know if this was random, street burglary, gang-related, other? I don’t know, however, my gut tells me not random. I just checked with Det. Jamieson @ SPD media and they hope to have some kind of an update from homicide detectives this afternoon. Has there been an update in info for us in the neighborhood? Thank you. You guys are both immature and selfish. Think about it – a kid is dead and you are all arguing over your egos, whether you realize it or not. Most of you wouldn’t even be commenting on this societal problem if it didn’t happen in “your neighborhood”… But that’s just my opinion. I live on this street and i will be danged if i know what our police chief could have done differently that would have made even the smallest difference. This is not the kind of neighborhood that needs to be patrolled 24/7 .. in fact.. it’s a nice quiet little street where we have block parties and wave to one another.. where one neighbor stops to talk to another if they find them in the front yard..
big excitement here is a car getting booted.. and one did this week. I don’t have clue who it belongs to. I am with Highland Park Neighbor.. we need to be kind to one another.. life is very fragile. and maybe after last night we need to get to know one another a little better and trade phone numbers with more than the people next door because when crime scene tape crosses your front gate the opportunity to stand on the corner with your neighbors and process what has just happened disappears. I am grateful for the West Seattle Blog but i would have like do extend the hospitality of my home to those who were sitting home alone last night trying to deal with the unthinkable. @Jans, there you are again telling people what to feel and think, and I didn’t see any condolences from you to the family and friends.